In honor of his birthday yesterday, I thought I'd take today's post on fandom to talk about the first BNF that I became aware of: Fred Hembeck. Some of the earliest comic books I had were some mid-1970s era DC books. Mostly featuring Batman and/or Superman. I loved those stories. But in the back of some of those books, by all that editorial nonsense that I never read, was a small comic strip. It was formatted and drawn like a strip you'd see in the newspaper, but this one was sitting by itself in a comic book. They usually featured DC heroes in doing some silly gag or pun. I thought it was a great feature. But it was evidently gone by the time I started actually buying my own comics. But a couple years later, at a local convention, I stumbled across a magazine featuring much the same style of artwork. 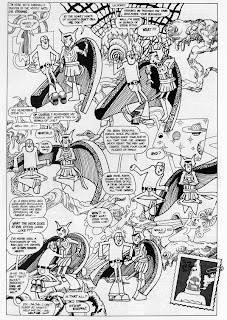 It was a collection of full-page strips by Fred Hembeck. (Fred, as you may well know, has a particularly distinctive drawing style, and he was probably one of the first artists I came to recognize by their artwork.) 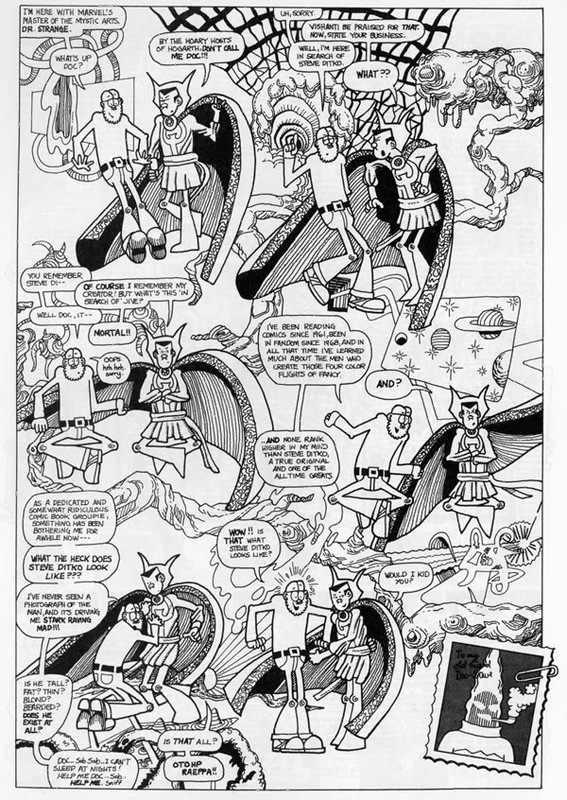 Rather than just featuring DC characters, though, Fred himself was the main character as he went through various comics universes interviewing all sorts of characters. Or sometimes, he'd just talk about some wacky comic book stories of the past. And I knew just enough comics history recognize he wasn't just making jokes about those old books. He clearly loved them and thought they were a lot of fun but, while he also clearly spent a lot of time studying them, he didn't take either them or himself too seriously. Fred's work continued popping up throughout my life in comics fandom. He popped up pretty regularly in Marvel Age and even got to write several one-shots, including the why-hasn't-it-ever-been-reprinted Fantastic Four Roast. All of his work, regardless of how/when/where I encountered it bore that same sense of both reverence and whimsy. He loved all comics it seemed, but he wasn't above poking fun at how absurd they could sometimes be. Any you know, from my fairly isolated fannish life as the only comics fan I knew, Fred was the first one to show me what fandom was like. That you could bury yourself in these arcane histories, but still have fun doing it. That you could interact with the medium on multiple levels. And it could really be a hoot! At some point, too, I realized that he was getting paid for the work he was doing. At the time, I still had this vague notion of the old Marvel Bullpen and drawing Amazing Spider-Man was a 9-to-5 job, but Fred's work was the first that really registered as freelance gig. (Obviously, all those comics jobs were freelance gigs, too, but it didn't seem like it to my 8-9-10-11 year old brain.) I can't say exactly how/why I understood Fred's role to be as a freelancer, but he seemed decidedly more like free agent compared to, say, Curt Swan or John Romita. They were company men, but Fred was his own man, talking about the comics he liked, and getting paid to do it. I eventually learned that Fred managed to carve a truely unique path for himself, and he holds an equally unique spot in comics fandom. And while I've studied fandom more estudiously over the past decade or so, I still try to keep Fred's basic idea at the forefront. These are comics, man, and they're a hoot! Fred is a treasure. One of the high points of all my con-going experiences was having him sign my very well-read copy of "Destroys the Marvel Universe."